Professor Dato’ Dr. Rahmah Mohamed, Vice Chancellor of INTI International University together with director and counselors from MARA Professional College (KPM) and MARA Higher Education Division during the visit. The visit was attended by a delegation of representatives consisting of directors and counselors of MARA College Banting, MARA College Seremban, MARA Professional College Beranang, Mara Professional College Seri Iskandar, Mara Professional College Indera Mahkota, MARA Professional College Bandar Penawar, MARA Professional College Ayer Molek and MARA Professional College Bandar Melaka, and was led by Dr Sa’aidah Binti Abdul Rahman, Deputy Director II (Curriculum), Higher Education Division, Majlis Amanah Rakyat (MARA). During the visit, the delegation met with Professor Dato’ Dr Rahmah Muhamad, Vice Chancellor, of INTI International University and other notable representatives from INTI, and were provided with details about the many recognized programs offered at INTI. It also provided an opportunity for them to preview the campus facilities and the student development programs available to the students from MARA’s Professional Colleges. This further helped them to identify suitable learning opportunities for the students upon completing their studies at the diploma level. 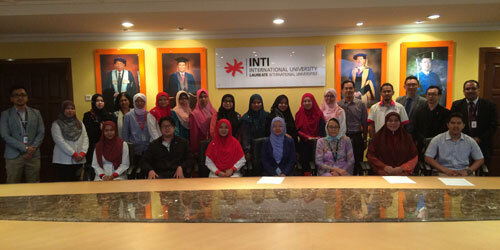 “We at INTI are honored to receive these guests from the MARA Professional College (KPM) and MARA Higher Education. INTI is committed to providing the best higher education options for MARA students and look forward to closely collaborating with them in the coming year,” said Professor Dato’ Dr. Rahmah .